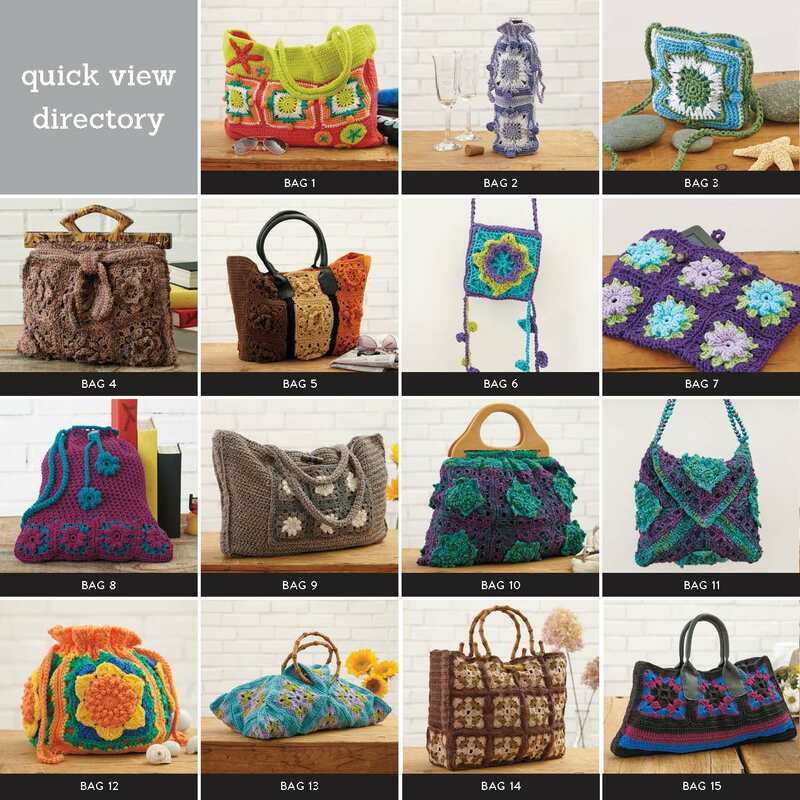 Margaret Hubert has created another fantastic crochet book for us to enjoy! 10 Granny Squares 30 Bags includes a beautiful collection of crochet patterns for purses, pouches, totes and carriers. It is truly inspiring to see how each Granny Square can be transformed into 3 completely different projects. 10 Granny Squares 30 Bags is a 128-page softbound publication filled with high quality color photographs and easy-to-follow written crochet patterns in US Crochet Terms. 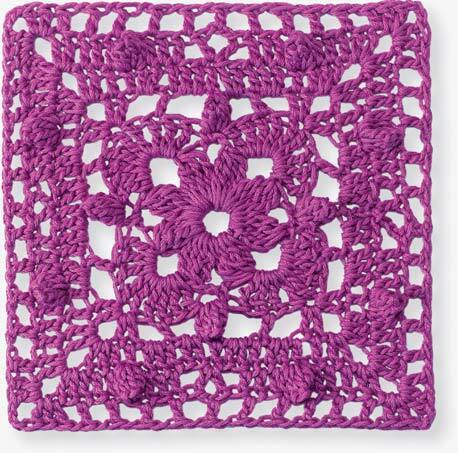 Each of the 10 Granny Squares includes both written instructions and a crochet diagram. Schematics for assembly have been included where necessary. The Abbreviations, Diagram Symbols and Term Conversions are provided on pages 124 and 125. Make a bold statement with this tote. Combine two contrasting colors, add some .owers and beads, garnish with a couple of tassels, and you have the perfect recipe for a bit of retro-glam whimsy. Make 12 Popcorn and Lace Squares (page 79) all in A. Fasten off, leaving a long sewing length. ROW 2: Ch 3 (counts as dc here and throughout), dc in each dc across, turn. Rep Row 2 until Gusset measures 42″ (106.5 cm) from beg. Fasten off A.
Rep Row 2 until Shoulder Strap measures 22″ (56 cm) from beg. Fasten off B. Line Front, Back, and Gusset with main lining fabric. Pin Gusset in place. Using whipstitch method, sew Gusset to Back and Front from the RS. ROW 5: Ch 4 (counts as dc, ch 1), *5 dc in center dc of next shell, ch 1, dc in next sc**, ch 1, rep from * across, ending last rep at **. Fasten off A. Fold Tabs in half, mark center, mark center of Gusset, place Tabs on either side of top of bag, matching center of Tab to center of Gusset. Sew Tabs in place. Line Shoulder Strap with contrasting lining. Sew Shoulder Strap to top of bag, centering ends over Gusset. Sew Shoulder Strap halfway up side Tabs, leaving the 2 shell rows free. With B, make 3 Libelle Dahlia Squares (page 16), working only the first 4 rnds for Flower. Fasten off, leaving a sewing length. Sew one bead in center of each flower if desired. Wrap B around a 4½” (11.5 cm) piece of cardboard 12 times. Wind a piece of yarn under loops at top and tie tightly. Slip the loops off the cardboard. Tie another piece of yarn around the loops ½” (1.3 cm) below the top. Cut the loops at the other end. Thread a bead at top of each tassel if desired. Sew Flowers and Tassels to bag using photo as a guide. Cover a ¾” (2 cm) snap with main lining fabric. Sew snap to inside at center top of bag. Beginning cluster (beg cluster): Ch 3, [yo (twice), insert hook in st or sp, yo, draw up a loop, yo, draw through 2 loops, yo, draw through 2 loops] 3 times in same st or sp, yo, draw through 4 loops on hook. Cluster: [Yo (twice), insert hook in st or sp, yo, draw up a loop, yo, draw through 2 loops, yo, draw through 2 loops] 4 times in same st or sp, yo, draw through 5 loops on hook. Beginning popcorn (beg pc): Ch 3 (counts as dc), 4 dc in same st or sp, drop loop from hook, insert hook in the 3rd ch of beg ch-3, pick up the dropped loop and draw through. RND 3: Beg pc in first sc, *ch 2, sk next 2 tr, 1 dc in next tr, ch 2, sk next tr, (2 dc, ch 3, 2 dc) in next tr, ch 2, sk next tr, 1 dc in next tr, ch 2, sk next 2 tr**, 1 pc in next sc, rep from * twice, rep from * to ** once, join with a Sl st in top of first pc. RND 4: Ch 3 (counts as dc), *[2 dc in ch-2 sp, 1 dc in next dc] twice, 1 dc in next dc, (2 dc, ch 3, 2 dc) in next ch-3 sp, 1 dc in next dc [1 dc in next dc, 2 dc in ch-2 sp] twice**, 1 dc in next pc, rep from * twice, rep from * to ** once, join with a Sl st in 3rd ch of beg ch-3. RND 5: Ch 6 (counts as dc, ch 3), 1 dc in same st at base of ch-6, *sk next 2 dc, 1 dc in each of next 3 dc, 1 pc in next dc, 1 dc in each of next 3 dc, (2 dc, ch 3, 2 dc) in next ch-3 sp, 1 dc in each of next 3 dc, 1 pc in next dc, 1 dc in each of next 3 dc, sk next 2 dc**, (1 dc, ch 3, 1 dc) in next dc, rep from * twice, rep from * to ** once, join with a Sl st in 3rd ch of beg ch-6. RND 6: Sl st to 2nd ch of next ch-3 sp, ch 4 (counts as dc, ch 1), *sk next dc, 1 dc in next dc, [ch 1, sk next st, 1 dc in next st] 4 times, (2 dc, ch 3, 2 dc) in next ch-3 sp, [1 dc in next dc, ch 1, sk next st] 5 times**, 1 dc in 2nd ch of next ch-3 sp, ch 1, rep from * twice, rep from * to ** once, join with a Sl st in 3rd ch of beg ch-4. 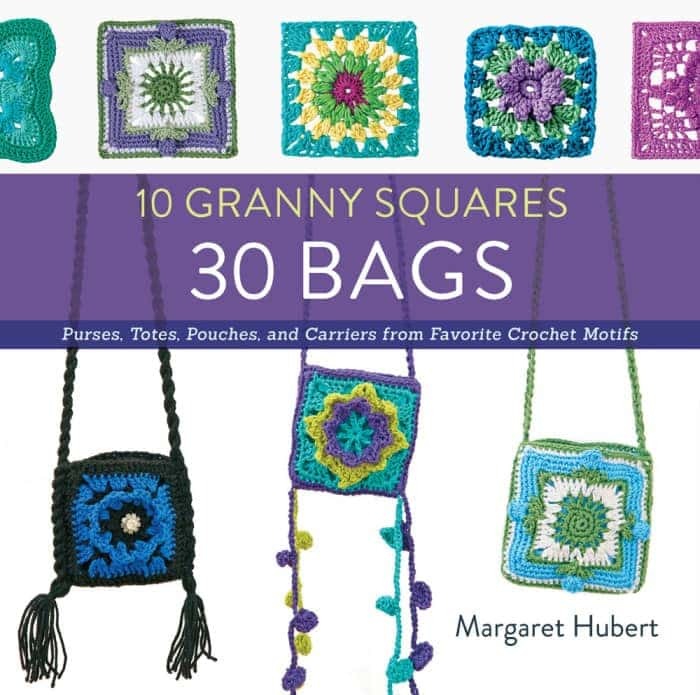 Excerpted from 10 Granny Squares 30 Bags by Margaret Hubert. Copyright © 2016 Creative Publishing International an imprint of Quarto Publishing Group USA Inc. Used by permission of the publisher. Photography by Glenn Scott Photography. 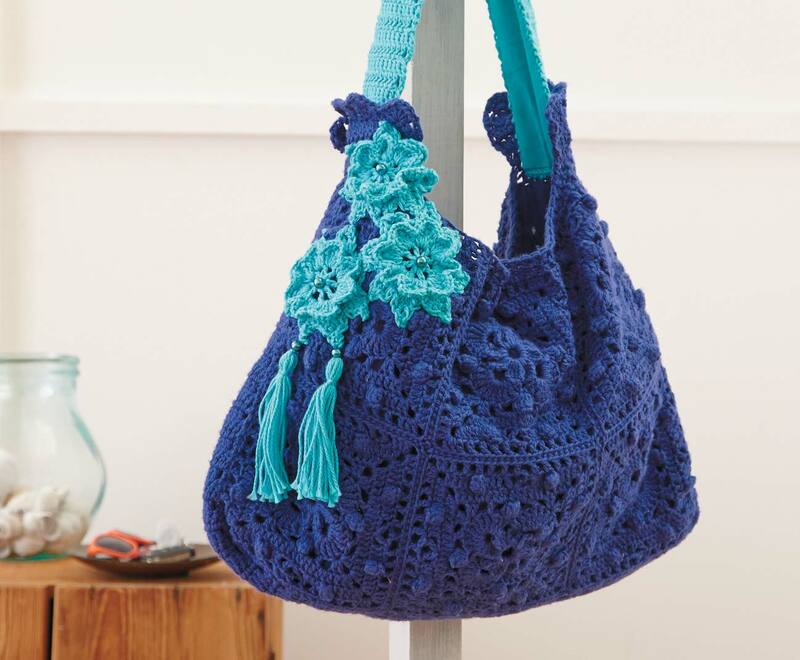 If you have ever wanted to make a crochet bag this book is a definite “must have” for your crochet book collection. 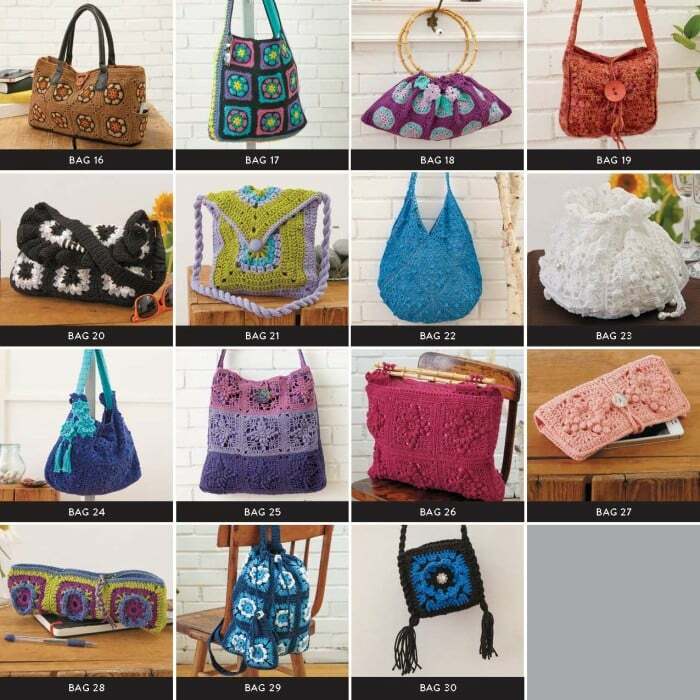 It includes 30 beautiful designs and specific techniques to make your bags spectacular! Thank you for this. I usually wouldn’t choose grannies as a bag option. I may have to reconsider that! Thank you for this review. I really like this book,there’s so many cute bags! Will be purchasing for sure.